When I found the plans for this Mission / Arts & Crafts Blanket Chest in Wood Magazine (Feb./March 2005), I just knew that it would just look great sitting next to my first big furniture project, the Barrister’s Bookcase and it would provide additional temporary seating as a bench. As with the bookcase, I chose to do this in White Ash and match the Golden Oak staining. Browsing around D. Lawless Hardware online, I found some really fun looking primitively carved Lion Head Corbels that I just had to have to add that touch of customization I wanted. One of the things I did in order to have the ‘best’ grain on the base/frame was to cut a select piece of 8/4 Ash along the 8/4 side and then glue them up to get 4in wide Stiles and Rails that were 1/4-sawn. That piece of Ash I selected appears to have been one of the first cut from a very large log and the grain was almost parallel to the width of the board. This was NOT good in the traditional sense but when cut as I described, it offered up perfectly straight-grained pieces that could be glued together almost invisibly. I had to alter the plans in that they called for the outer stiles to be 4 1/4in wide. This would have left me in a lurch, but with the use of 1/4in “Space Balls” in the dados, that extra 1/2in of space, along the front and rear, was utilized to my advantage without having to alter any other dimensions. And THIS time, when cutting the board for quartersawn grain, the resulting boards remained straight! Last time I did this, using Maple, the resulting quartersawn boards warped more than usual. On this project, I purposely chose to make ALL dados and tenons using only the tablesaw. While I had earlier built a horizontal mortising machine, I just wanted the experience on the tablesaw. This turned out to be a mixed blessing in that the tablesaw dados were faster to cut, though not quite as accurate even when using my Super Sled. I am sure some of that inaccuracy came from my inexperience and my NOT clamping the piece onto the sled each and every time. In the above last image in the set you can see where I had to shim the dado for the floor of the chest on the underside. I had made the mistake in measurement and had cut my floor piece dado one blade width too wide. The rest are just fillers for the legs. The shim fix came off really well, but lesson learned for sure. As a matter of fact, after completing this chest, I built a nice hardwood adjustable Dado Jig to take the guess work out of my dados in the future. Very nice. The lion heads add a lot of interest to this piece. Great looking Chest Mike,the corbels really give it a unique flavor. Nice work Mike, It looks great next to the bookcase. I had to laugh when I saw the fifth picture, it looks like the lion’s are screaming because you have clamps on their faces! That turned out just super and the lions added significantly to the overall look. Good looking chest Mike, ditto on tinnman65 comments. I had a good laugh. I like it. Great job, those corbels really set it apart. Hey thanks folks. I guess what attracted me to the Lion corbels is that they bring to my mind a younger time in my life and make me think that this chest could be some child’s Toy Chest, full of wonders and dreams about the future. 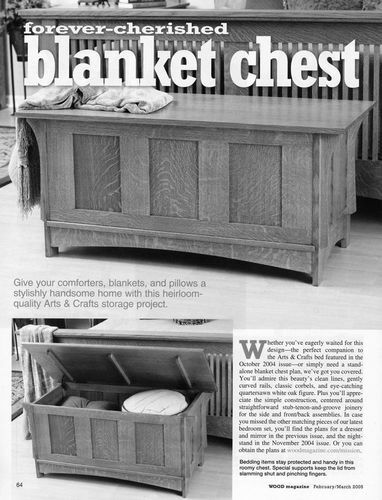 Very nice blanket chest. I checked out your web site and thats pretty cool. Mike! Great work! The chest looks great! Thanks so much for mentioning our store! If you didn’t already know, there is a lumberjocks.com coupon at D. Lawless Hardware. Entering “lumberjocks” during checkout will get you 10% off. Keep up the good work!